Judge Josh Berkowitz serves on the Hamilton County Municipal Court, 4th District. Judge Berkowitz hears cases from all over Hamilton County in one of Ohio's busiest courts. These include criminal, civil, & traffic cases. Before taking the bench, Judge Berkowitz served as an Assistant Hamilton County Prosecutor in the felony/trial division. Judge Berkowitz also served as Law Director for the City of Norwood, where he was the city's Chief Legal Officer. 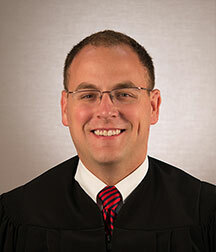 Judge Josh Berkowitz was born & raised in Cincinnati and is a graduate of Elder High School, The Ohio State University, & Capital University Law School.